As many of you know, I am passionate about random acts of kindness. Well, ok… that’s probably an understatement. 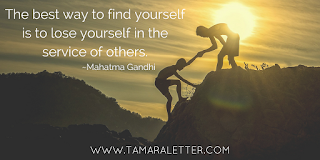 I am BEYOND passionate about kindness – it is my life’s purpose! I truly believe with all my heart that simple acts of kindness are the threads that keep us woven together in fabrics of peace and joy. I love sharing my passion for kindness in the lessons I teach with collaborating teachers and their students. 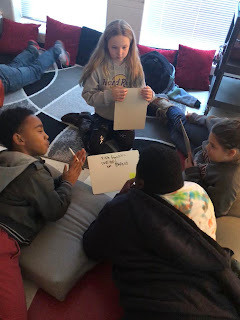 Whether it’s writing prompts or multi-step word problems, I can usually find a way to showcase the power of kindness in most things I teach each day. Sometimes, however, I am provided an opportunity to devote an entire class period to kindness and that’s when my heart SOARS! It’s usually an integrated lesson where the standards of learning mesh with at least one of the 4 Cs (critical thinking, collaboration, communication, and creativity). Recently, at a district innovation meeting, I was introduced to a 5th C: Community Service. When we asked our students at the beginning of the year how they could show kindness to others, many mentioned feeding the homeless. They referenced seeing people on the side of the road with “Help! Hungry!” signs and giving food as an easy way to help them out. Our conversations since then have continued to cycle back to the homeless, so my collaborating teachers, Mrs. Cross and Mrs. Madison, decided that this holiday season would be a perfect time for us to show our students the power in serving others unseen by assisting a charity organization in their preparations to feed the homeless this spring. Caritas is a global organization with community outreaches that care for homeless individuals for a week at a time. They provide a safe place to sleep, access to hot showers and basic supplies, three hot meals a day and lots of opportunities for playing games, chatting with others, and meeting others who can provide resources and advice for getting back on their feet again. Simply put, they use kindness to give people hope. We decided we would help their mission of kindness as we focused on the power of giving versus receiving. We transformed the Innovation Lab into work stations with two separate tasks. One station would focus on creativity as students decorated plain place mats with inspiring messages and illustrations. The other station would focus on communication and collaboration as students worked in an assembly line to wrap plastic silverware in napkins, securing with a small rubber band, which would be given to homeless individuals as they sat down at a table to enjoy a warm meal with others. When students entered the Innovation Lab, we discussed the purpose of our service and how our small acts of kindness would impact others on a larger scale. We also talked about the stations and how there is joy in the journey of working together for the common good. The room quickly filled with chatter as students got to work on their designated tasks. 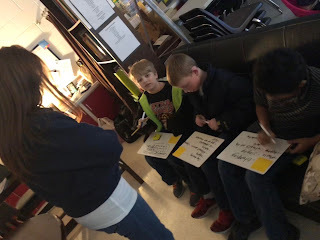 Students in one group brainstormed things they could draw and write while students in the other station discussed the most productive way to organize and wrap silverware. Time passed quickly. We only had a limited amount of time, so our stations were short – only 20 minutes for each. Our goal was simple: make as many place mats and silverware bundles as we could in the time we had. Inevitably, we ran out of forks, so our silverware task members joined back in with the place mats group to create even more inspiring works of art. When our time came to a close, we had students count the place mats and silverware bundles. We then took advantage of the teachable moment to toss in a little math as we added the totals between the classes for a grand total. How many people would be touched by our acts of kindness? You could hear the cheers of our students all they way down the hall! They couldn’t believe how much they had accomplished in such a short amount of time. It was such an empowering lesson! Even though these items won’t be used until spring, we know that someone will be touched by our acts of kindness and generosity. Today that person touched by kindness is me. Kindness inspires. Be the change! 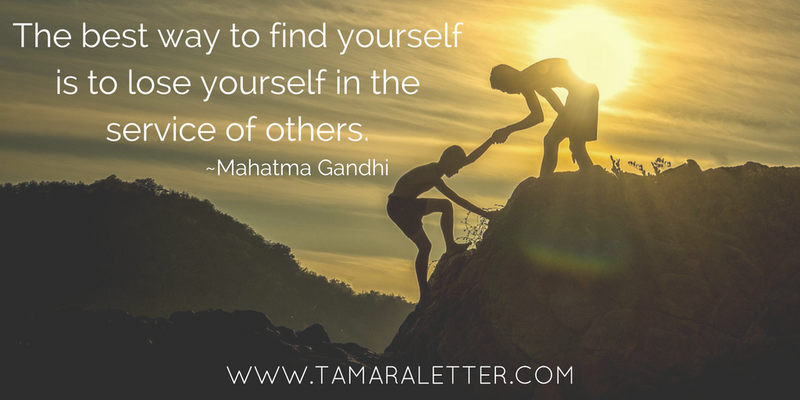 Seek out opportunities to give back to your community and make a difference in someone else’s life. Small moments matter, even if unseen. Each December my world is a whirlwind as I’m sure many of your worlds are, too. There’s so much to do! There’s so little time! It’s an unbalanced force of nature that heaps on additional stress from party planning to gift giving to oh-my-goodness-we-are-out-of-tape-on-Christmas-Eve panic that is enough to make anyone want to crawl into the chimney themselves and hide. Despite the chaos of holiday happenings, I secretly LOVE this time of year! Oh, the joy of writing by the twinkle of lights on my tree, decorated with decades of memories from my family! Oh, the love shown by others as Secret Santas sprinkle kindness to make someone else’s day just a little bit brighter! Oh, the jubilation of doing fun, creative lessons at school where holiday themes and acts of service trump standardized tests and worksheets! 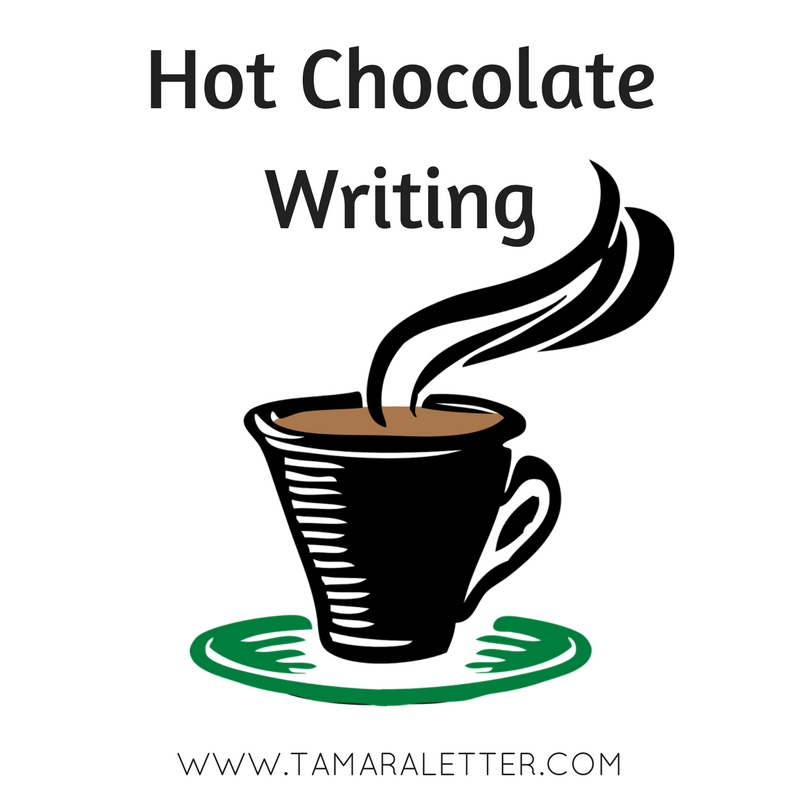 One my my tried-and-true, favorite lessons to teach this time of year is “Hot Chocolate Writing.” It’s an engaging lesson that can be adapted for any age level and is sure to bring a smile to many! The lesson begins with sounds of Sleigh Ride jing-jing-jingling throughout the room as students enter our Innovation Lab. They pick up their supplies from the table and sit anywhere they like. They have a small white board, a dry erase marker and an eraser. There’s already a buzz of excitement in the room because the lights are dimmed low, music fills their ears, and they already know it’s going to be a fun lesson! Once students are settled in their chosen spot – some are in wobble seats, others on cushions, a few on the sofa and carpet – we share a conversation about their first impressions of today’s lesson. They mention the music, the flexible seating, the materials “with no directions on what we’re supposed to do” and inevitably someone mentions the colored post-it notes I’ve placed on the back of their white boards. The engagement factor is buzzing now as side conversations erupt. Ahhhhh… the hook has grabbed them already! It’s then, with rapt attention, I talk about sights and sounds and all the ways people are drawn into whatever the experience may be. We talk about movies. Videos. Commercials. Cartoons. We discuss the power of storytelling and how it all begins with someone writing a screenplay, a script, a storyboard, a scene. I then offer the challenge: List the five senses on your white board in less than 30 seconds. The only sound you hear is markers sliding across the boards. 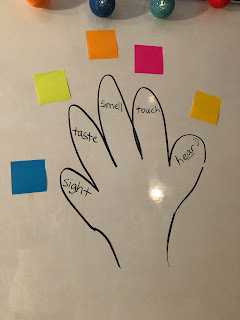 I draw a very primitive picture of a hand and the students tell me which senses to add, labeling the fingers. 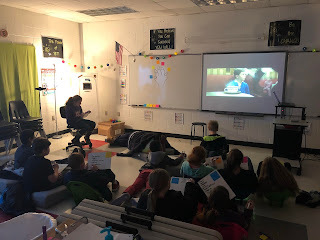 It’s then that we shift our focus back on the power of stories and we watch a video clip from the movie, The Polar Express, that shows waiters and chefs serving hot chocolate to children on a train. The students are easily pulled into the moment as they watch with wide eyes and smiles. For many this is a familiar scene. For some, it is new. Look on your white board to see which color you are assigned and which sense matches your color. Watch the same video clip but this time focus only on your designated sense. What details can you add to your white board? We watch the video again as students fill their boards with descriptions. 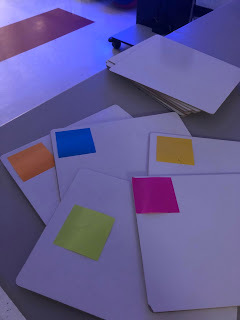 After the video ends, they are told to find their group members (based on color of post-it notes) and share insights to dig deeper and create more meaningful descriptions. The room is noisy, but productive, the creative banter ringing like bells across a snow-filled meadow. Time is limited so they work quickly, then we gather back together as a whole class to start sharing ideas of what to put in our descriptive paragraph. We go from group to group, sharing details based on the sense we were given. 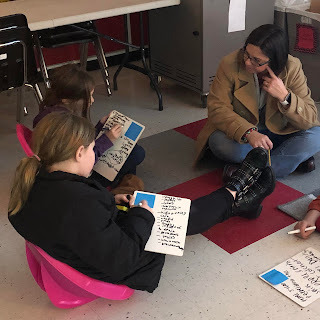 We begin with sight to set the basic flow of the paragraph, then move to sound, adding descriptions, changing the order, creating compound sentences with commas and comparisons. Then we add in smell, touch, and taste. Our writing as a class is messy. We misspell words. We fix them. We realize we left out key information. We add it back in. We ponder synonyms and syntax. By the time each group has shared their suggestions, our basic summary of a movie scene is filled with detailed descriptions worthy of the big screen. We read our story together. Critical Thinking – Students have to focus on their chosen sense and filter out other senses in their white board descriptions. They also have to think of figurative language which can be a challenge for some who struggle with abstract concepts. Communication – Students communicate constantly in this lesson. They share their ideas. They write. They speak. They shift their conversations from internal dialogue to peer sharing to articulating ideas for the class. Collaboration – Students take individual ideas and expand upon them in small groups, later collaborating as an entire class to join in the writing process. Creativity – Students think of creative ways to describe something of familiarity with others. We get excited when words work well and annoyed when they don’t. If you are looking for a fun-filled activity that will engage your students in the writing process, you may want to serve up a cup of “Hot Chocolate Writing” as you wind down this holiday season. It’s sure to put a smile on your face and theirs! I started this blog post in April and never finished it, the pain too raw to share. 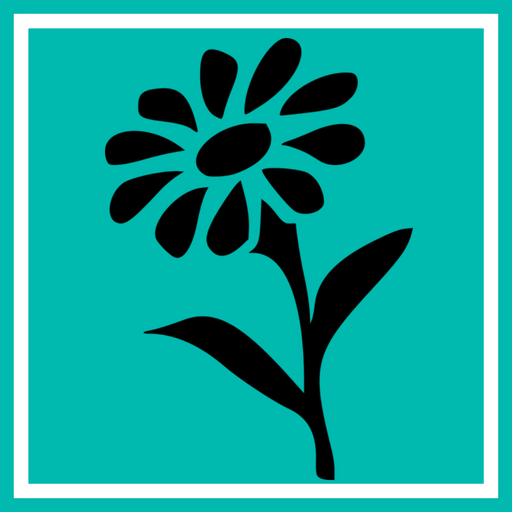 I was in the midst of watching my mom deteriorate, her body weakened from the throes of terminal cancer. 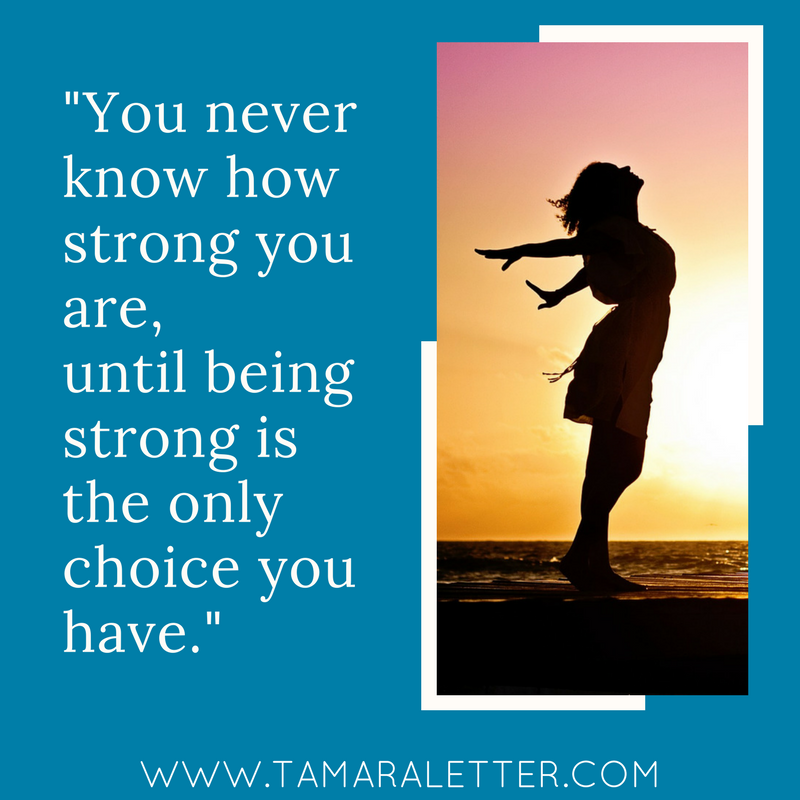 As I sat by her bedside, watching her rest, I began writing about my #oneword17 – resilience. On January 1, I knew it would be a tough year. I had watched my mom undergo two rounds of chemo with a third on the way and the outlook was pretty grim. I knew I would need to be strong for her, strong for my kids, strong for the family. Resilience was the only word that came to mind. I tried to write about resilience as the storms of life swirled around me, but the breadth and depth were too much to describe with accuracy. It seemed like every time I caught my breath, I was swept away again, continuous tidal waves of chaos and heartbreak. In May, after she passed away, I was in a fog for a bit as my beaten-down spirit struggled to keep up with all the “lasts” of my daughter’s senior year. Two months later, I sent that same sweet girl to college, the first of my children to fly the coop. The transition from a family of five to a family of four “with one away at school” was odd; my Momma’s soul was happy for my daughter’s new opportunities, but despondent by the new normal. It took a few weeks to adjust – resilience once again pulling me through. Then I got the news that my Uncle Garland had passed away. I threw myself into the new school year, helping to transform our traditional computer lab into an Innovation Lab. I quickly discovered that shifting a cultural mindset was much more complex than purchasing foldable tables and bean bag chairs. Now here we are, the start of the holiday season and my world is busy, too busy actually. Last week I was faced with several project deadlines with limited available time. 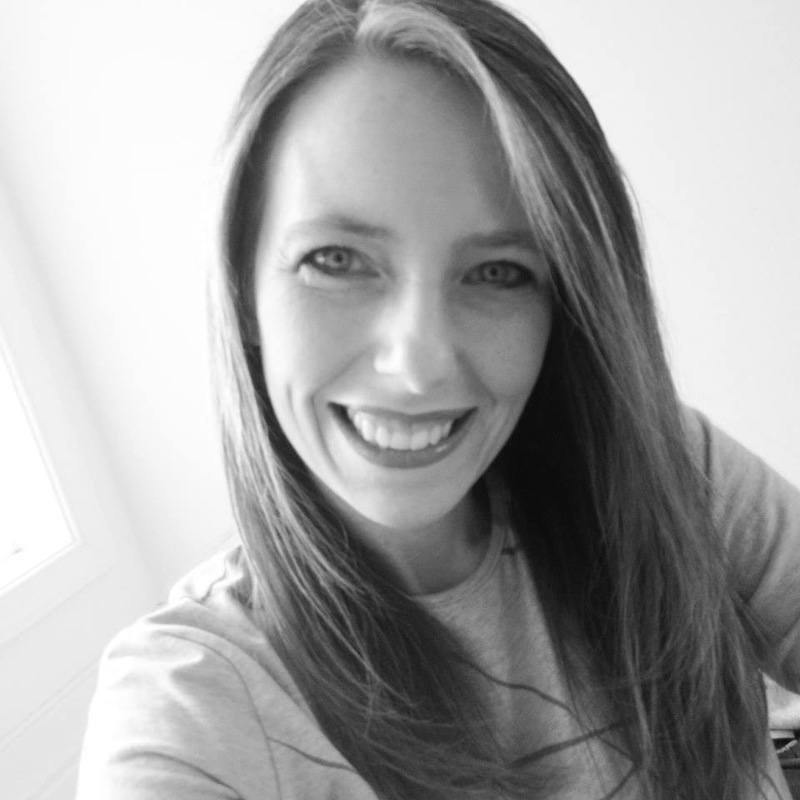 Being a recovering perfectionist, I battled the “must be 100% perfect” mentality as I stayed late at work each day then continued my work at home long after the boys were in bed. We had Reading and Math night where it was standing room only in my Mission to Mars activity station. Four rotations later, I lost my voice. The next evening I drove three hours west to join others on the VSTE Conference Committee with four full days of non-stop action from morning to night. This morning, as I was packing up to head home, I got the message that my cat died. Friends, I couldn’t make this stuff up if I tried. This time last year, I was rushing home to visit with my dying mom. The year before that, I was rushing home to visit with my dying mother-in-law. Now the cat is gone and I’m rushing home to console my children while my heart is mourning, too. The act of falling down flat on your face and figuring out how to pull through and start again. It’s been a tough year, but one thing I’ve learned from my #oneword17 is that I am tougher than I ever thought I could be. I just need a little break to rise again.